Curling up with an electronic reader on a rainy day may be the way of the future, as big-box bookstore Borders will soon close its doors. Hundreds of people trekked to the book retailer in Sterling as “Going out of business” and “Everything must go” signs blared from its shop windows. A liquidation sale continues to draw bookworms of all ages – the check-out queue stretched to the far end of the store July 22, as residents aim to fill their home libraries with collections of paper and hardbacks that will surely be harder to come by in the future. Borders in Sterling had a steady stream of customers and lines extending toward the back of the store July 22. “This is ridiculous, I almost feel bad about buying books just because you’re supporting a business going out of business,” said Alexandria resident Clint Greenlee. Greenlee said he doesn’t like the idea of people being even more dependent than they already are on electronics to purchase music, videos and books. Some believe the fall of Borders at the hands of e-readers may be an unceremonious harbinger to the demise of the printed word. Sterling resident Bob Phillips said his dentist advised him to visit Borders’ closing sale because in the future everyone will be reading electronic books. Borders filed for bankruptcy protection in February as it tried to reposition itself as a smaller company, announcing that it would close 30 percent of its stores that month. Last week, the company said it faced too many competitors in the online marketplace and was unable to repay its debts, announcing that it will close all of its 399 stores nationwide by September. 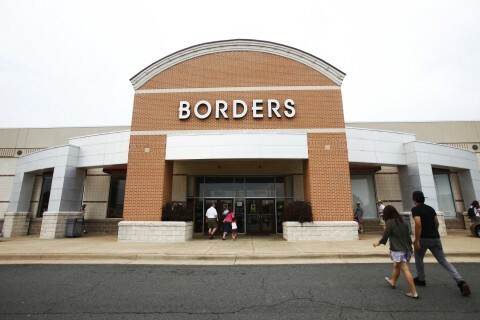 Borders has two stores in Loudoun – the Sterling location employs eight people and a Borders Express at the Dulles Town Center employs 10 people. Tanya Bittenbender, the executive director for the Loudoun Literacy Council, said the organization is benefiting from Borders’ closure – they’ve already received 34 donated boxes of books from the retailer. Still, residents will lose a space to share in the joy of reading books, Bittenbender said. “It’s about creating a culture that is focused on pulling people together and reading the written word,” she said. Public libraries are stepping up to fill the hole in reading programs where Borders will leave off, she said, but Loudoun’s access to bookstores and good books stores will diminish. Books-A-Million will be the sole big-box retailer in Loudoun when it opens an expanded store later this year at the Village at Leesburg.